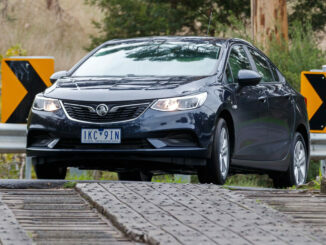 A great colour hybrid with some good family friendly features. 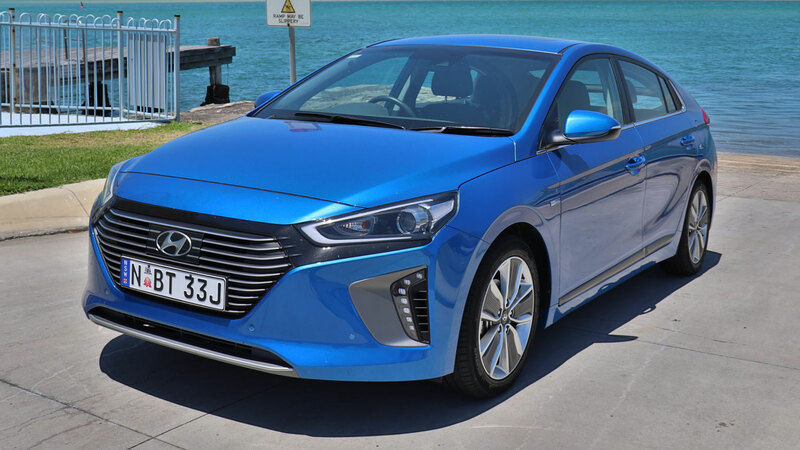 The Hyundai Ioniq I tested is a beautiful blue coloured five-seater with a low-slung sedan type shape and a choice of eco-friendly all-electric, plug-in hybrid and hybrid engines. 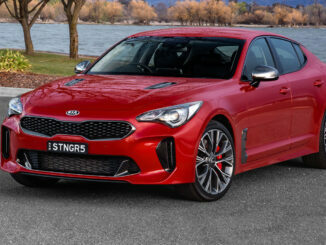 Due to the low roofline of this style of car, parents understandably favour SUVs, even though they aren't necessarily the most fuel-efficient option! 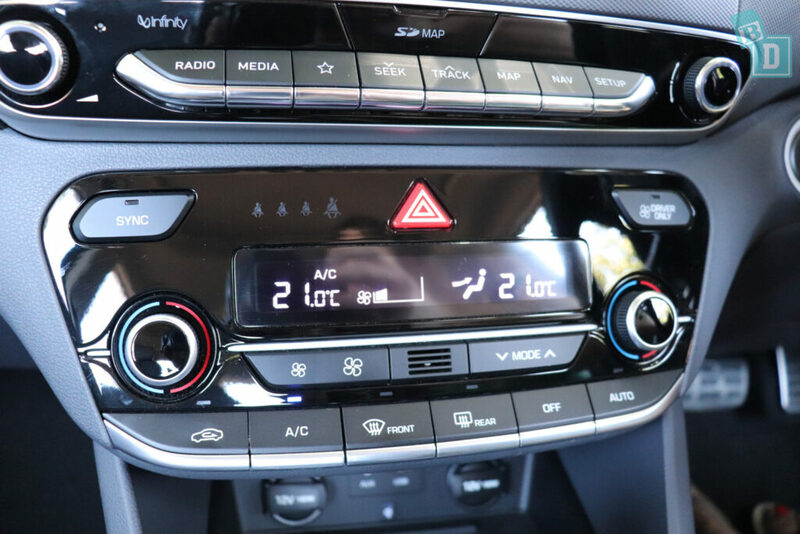 I loved Hyundai's Santa Fe and Tucson SUVs when I tested them, and I have recently tested hybrid versions of Toyota's Camry and Corolla, so I was keen to test the hybrid version of the Ioniq with our family and see how good it was as a BabyDrive!! The Ioniq's roofline is low but it's the fact it tapers in at the top that prevented me from being able to install three child seats as it just narrows too much at the top for three child seats to fit across. The rear seat base is also quite sculpted, which also made it difficult. The Ioniq has top tether points on the back of all three rear seat backs, which are all within plastic guides and easy to connect to. 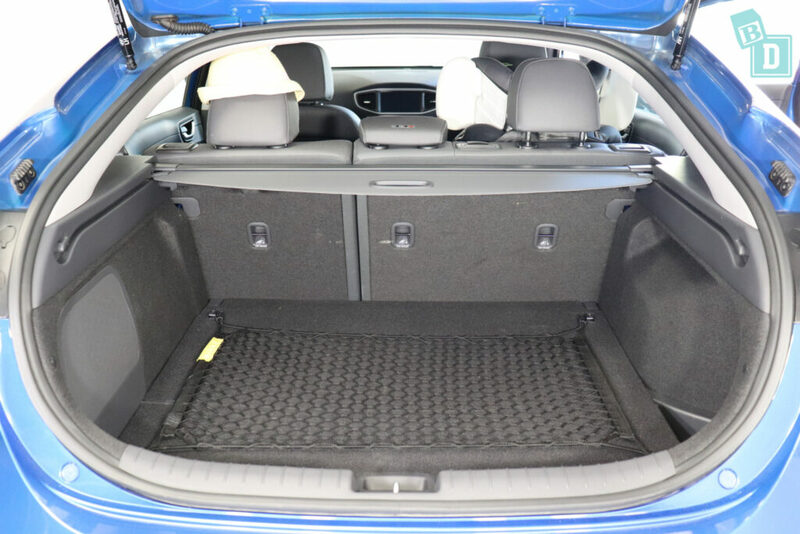 The Ioniq has ISOFix in the two outer rear seats, but they are not within plastic guides and I found them quite difficult to connect as they were quite hard to reach. With rear-facing child seats installed, there was 27cm of knee room for a front passenger to sit in front of them. The Ioniq has some clever storage features that I was immediately a fan of! The first were the generous door handle wells which we had to unearth a lot of little kid trinkets out of at the end of the week as we'd all found them so handy! 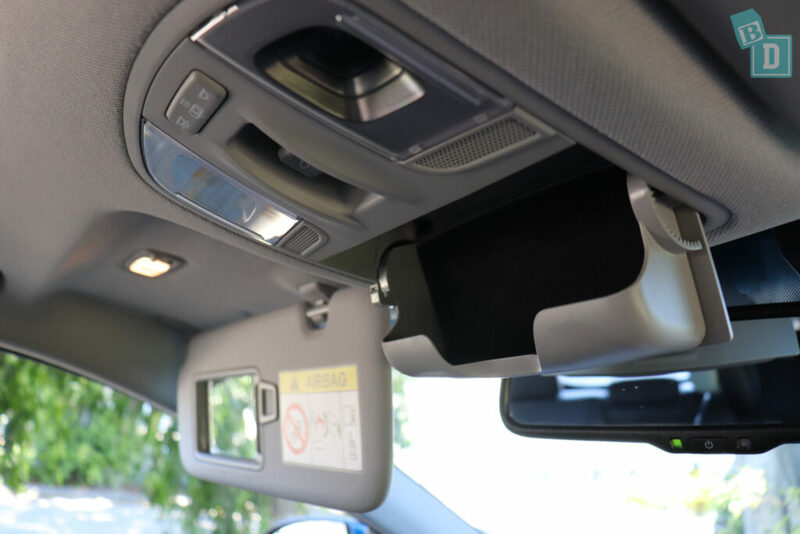 There is also a big groove that runs along the central console which is fantastic for storing an iPad while you're driving but of course does not conceal it when you get out of the car. 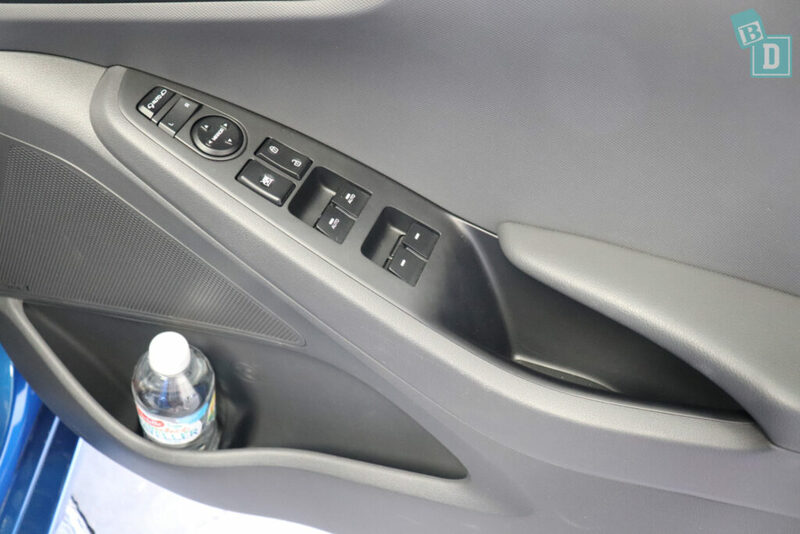 Overall the storage in the front of the Ioniq is very good; there's a wireless charging well for your phone, sunglasses case, the cup holders well sized for coffee cups and large refillable water bottles and the door bin holds a large refillable water bottle. The central console box and glove box are a bit small but still practical. 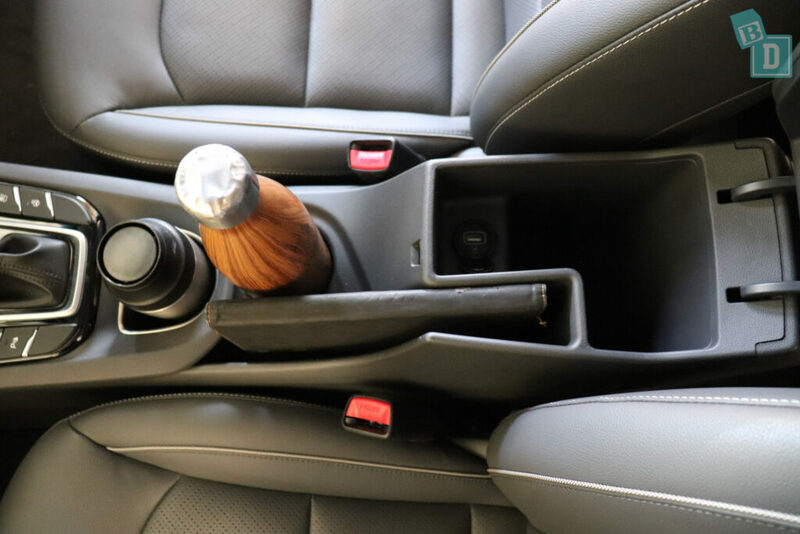 In the back, storage is limited to one net map pocket and the door bins are smaller and will only hold a 600ml bottle but the handle wells are still great and there are two cup holders in a fold down armrest in the central seat back that will hold a re-usable and disposable coffee cup. Storage in the boot was quite good and from empty it would hold 11 shopping bags. All styles of stroller, from twin to compact, would fit along with some shopping and with the roller cargo blind pulled across. The boot floor was nice and flat, suitable for an emergency nappy change and there is a cargo net on the floor that I found useful for holding my bub's lunch box and ball in place so they don't roll about the boot. The media system in the Ioniq is great! 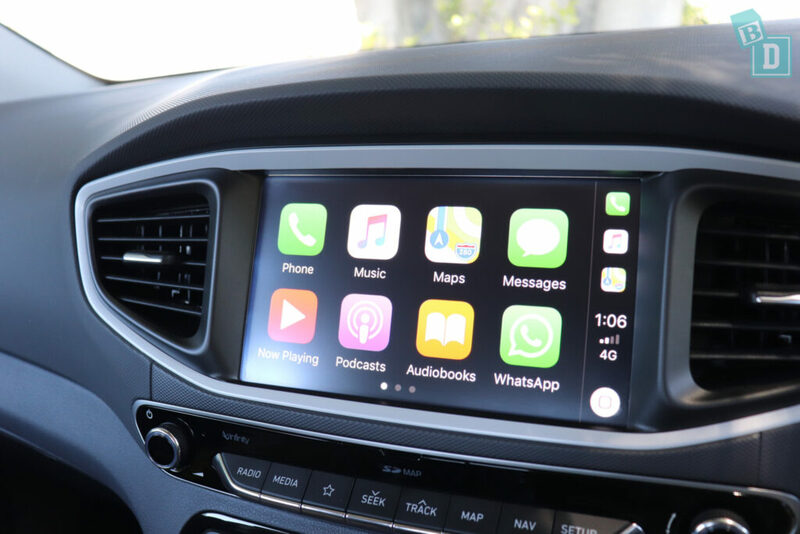 It is so easy and simple to use with a nice clear, crisp screen and it has Apple CarPlay and Android Auto. 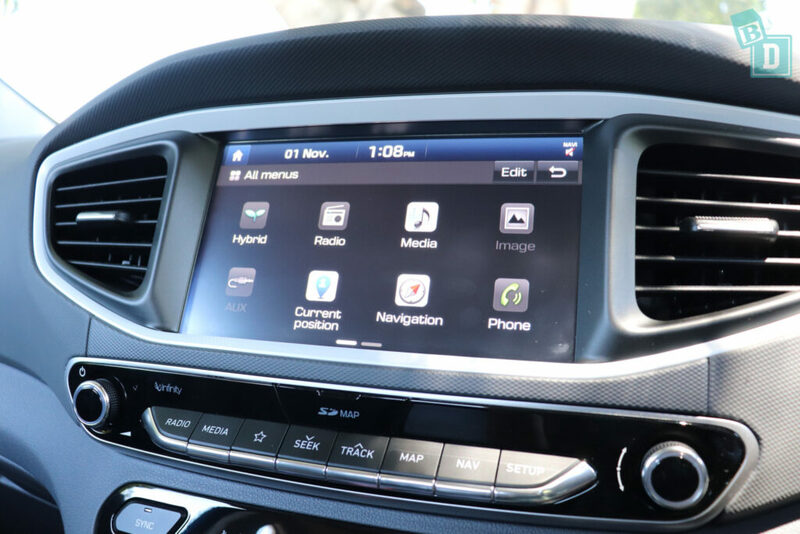 The sat-nav is easily navigated and the announcements easily muted too with a button on the left of the screen. The reversing camera has a good visual and I could turn the reversing sensors off altogether with a button down in the central console, I didn't find a way to easily turn off just the beeping which was very loud! The Ioniq has some great safety features like lane departure warning which did come with a loud beep and I found the lane keep assist was rather forceful when keeping you in lane!! I found the Hyundai Ioniq quite a nice car to be in, the windows are large and the split rear windscreen gives great visibility lower down when reversing. Being a hybrid, it is quiet to drive at low speeds around town and you can see when you are using battery power rather than fuel which is fantastic for driving kids to sleep in the car and when parked up while they are asleep with the aircon running. I did find the Ioniq slow to accelerate from junctions and roundabouts, although it is smooth. On the motorway, it's as if you can feel the road surface through the floor of the car which is disappointing. I feel the Ioniq has had a lot of thought put into its design and it ticks a lot of boxes. The Hyundai Ioniq scored a five-star ANCAP safety rating in 2016 and has seven airbags as standard. 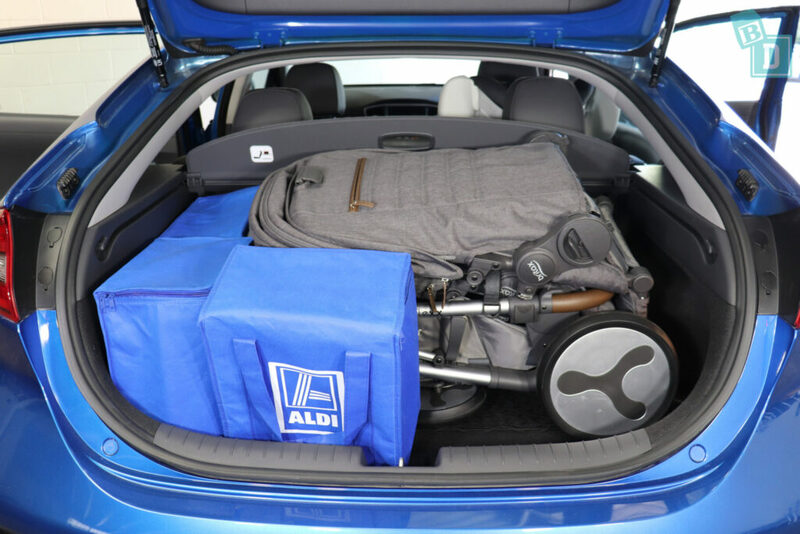 So… How big is the boot of the Hyundai Ioniq? 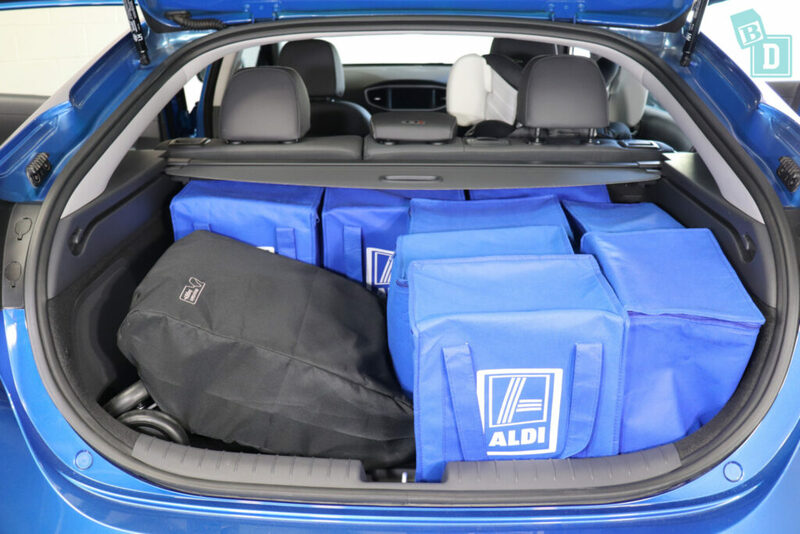 From empty, I could fit 11 shopping bags in the boot of the Ioniq. The Mountain Buggy Duet twin stroller fitted with one shopping bag beside it. The Britax Flexx tandem stroller fitted with three shopping bags beside it but the roller blind could not slide across. The Mountain Buggy Urban Jungle single stroller fitted with three shopping bags beside it. The Mountain Buggy Nano compact stroller fitted with eight shopping bags beside it. I wouldn't put a dog in the boot of the Ioniq because of the large sloped back windows I feel it would be too hot for a dog in there. 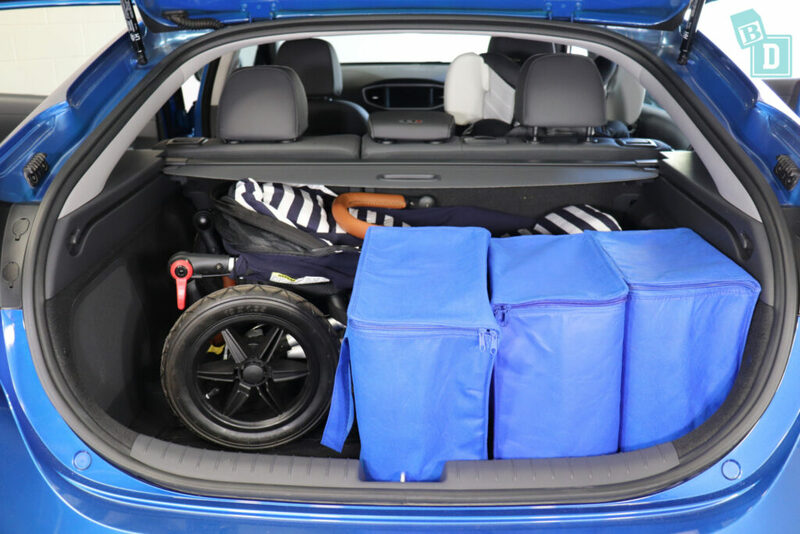 The boot floor is nice and flat in the Ioniq so you could do an emergency nappy change! 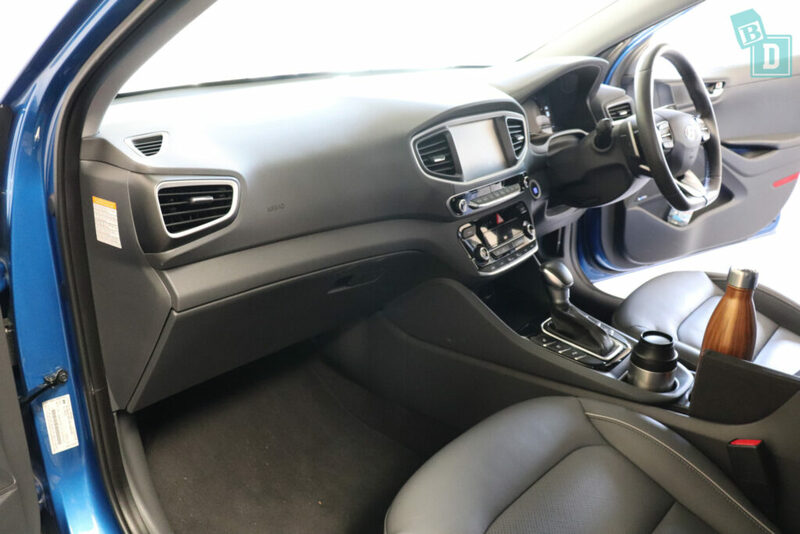 Storage in the front of the Ioniq is really good, there are two cup holders in the central console, the one in front is a really good size for a reusable or disposable coffee cup and the one behind will fit a large reusable water bottle. Beside them is a long grove that would hold my iPad nicely while driving. The central console storage box is of adequate size and has a USB port inside. 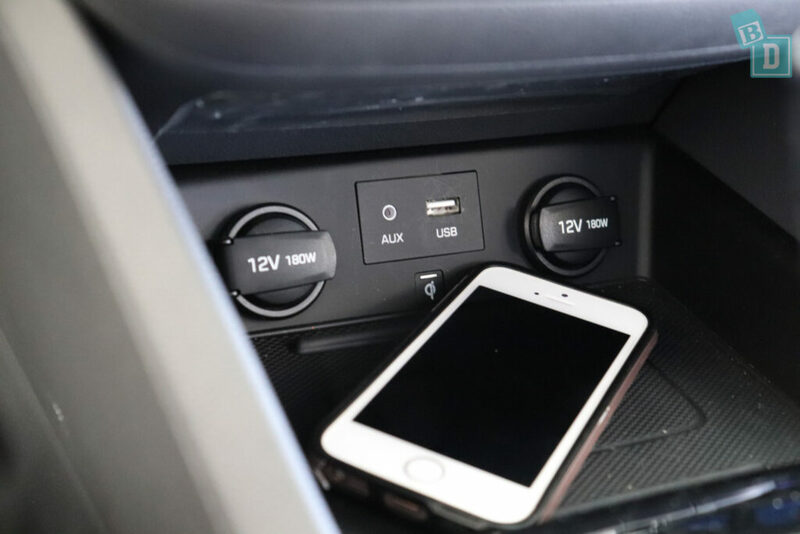 In front of the gear lever is a wireless phone charging well, with two 12V sockets, a USB and AUX socket too. The glove box would fit my wallet with the manual but my iPad didn't fit. The front door bins were big enough to hold a 600ml bottle and my large refillable water bottle fitted in there too, there are fantastic wells in the door handles in the front and rear doors. There is a glasses case in the ceiling that is lined so it doesn't scratch your glasses and lit vanity mirrors in the front visors. 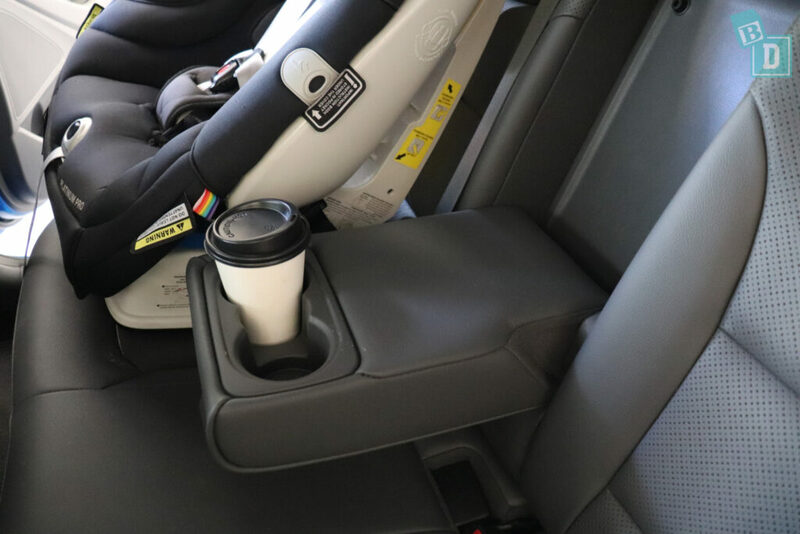 In the back there are two cup holders in a fold-down armrest in the central seat back; they held a reusable and disposable coffee cup. 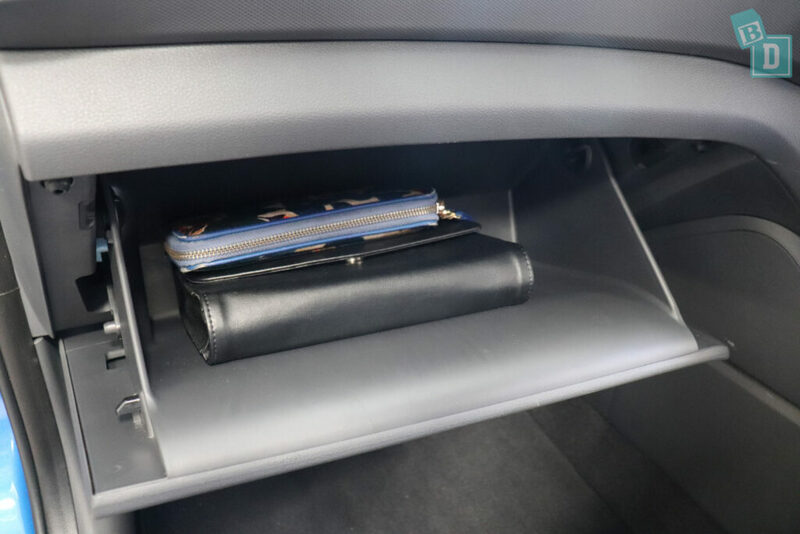 The Ioniq only has a single net map pocket, which would hold an iPad but not conceal it. 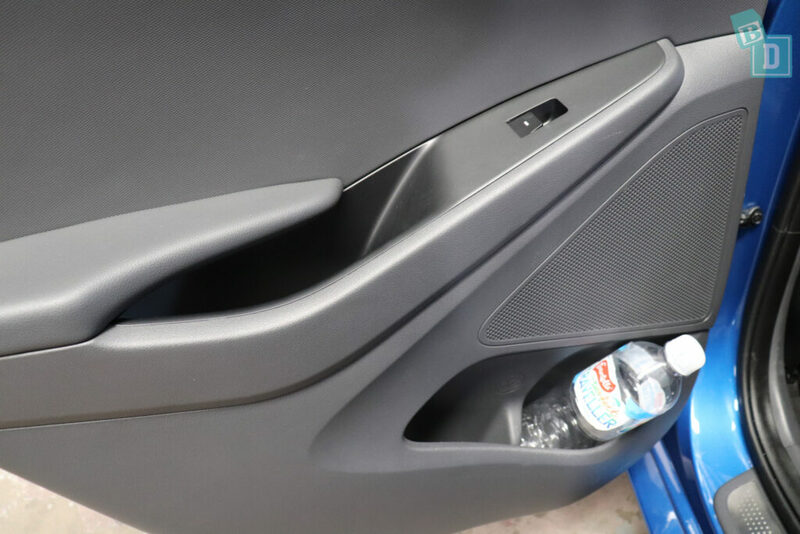 The doors in the back of the Ioniq have the same great handle wells as the front ones but the door bins are smaller so only a 600ml water bottle fits in them. So… How noisy is the Hyundai Ioniq? Being a hybrid the Hyundai Ioniq is quiet when it starts up and almost silent when it pulls away which can take a bit of getting used to! The transition between the electric motor and petrol engine was nice and smooth around town at low speeds, but on the faster roads and motorways, the Ioniq felt a bit rougher as if you could feel the road surface through the floor of the car and road surface noise was quite loud. The quiet electric motor was great for driving my daughter around our suburb to get her to sleep, however, I did find that when sat with the aircon running while my daughter slept the petrol engine sometimes kicked in and was quite loud and disturbing. 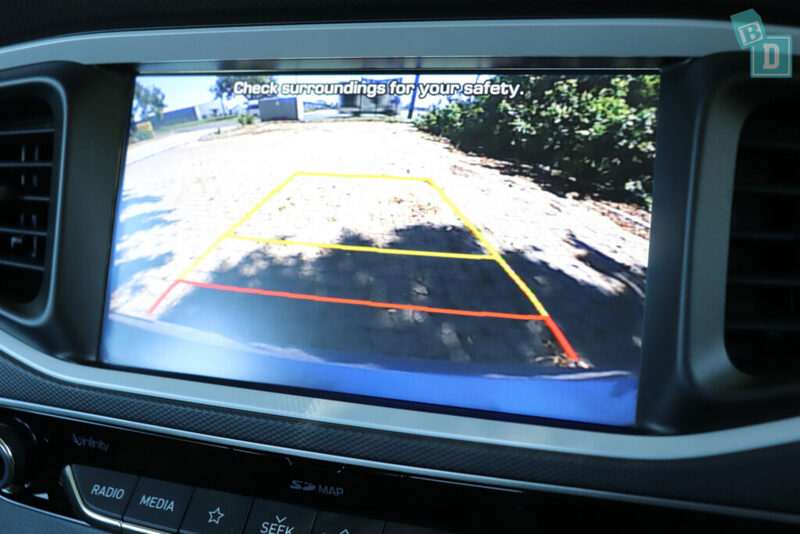 The reversing camera in the Ioniq provides a nice, clear image. 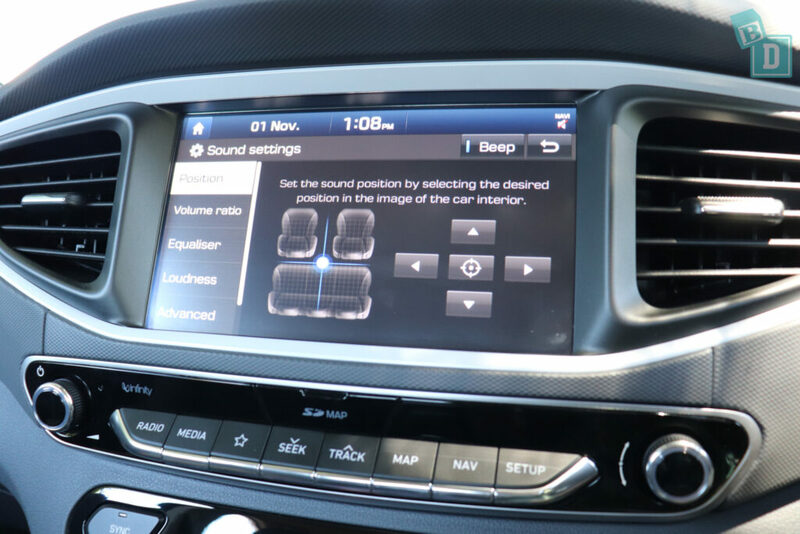 However, the only way to mute the parking sensors is to press the button down in the central console which turns the sensors off altogether. The media system in the Ioniq is really good, it's very easy to navigate and use and it has Apple CarPlay and Android Auto. A feature I do love in the Hyundais is the drag and drop system of moving where the sound comes out of the speakers in the car, so I can divert all Wiggles songs and nursery rhymes to the back seat!! I found the media system very easy to connect my phone to and it played nursery rhymes straight away when I plugged my phone in which was great! 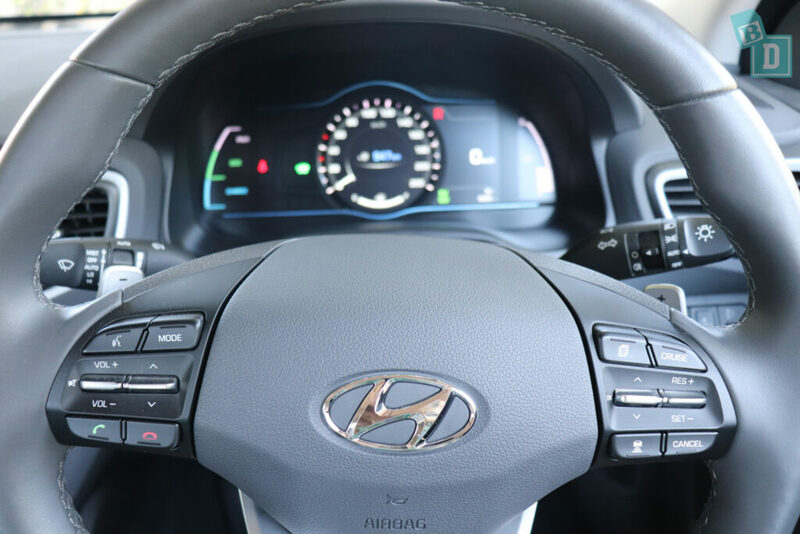 The cruise control in the Ioniq is really good, the controls are on the right side of the steering wheel, they are easy to use and the cruise control I found to be accurate on motorways as well as at 60km/h on undulating roads. 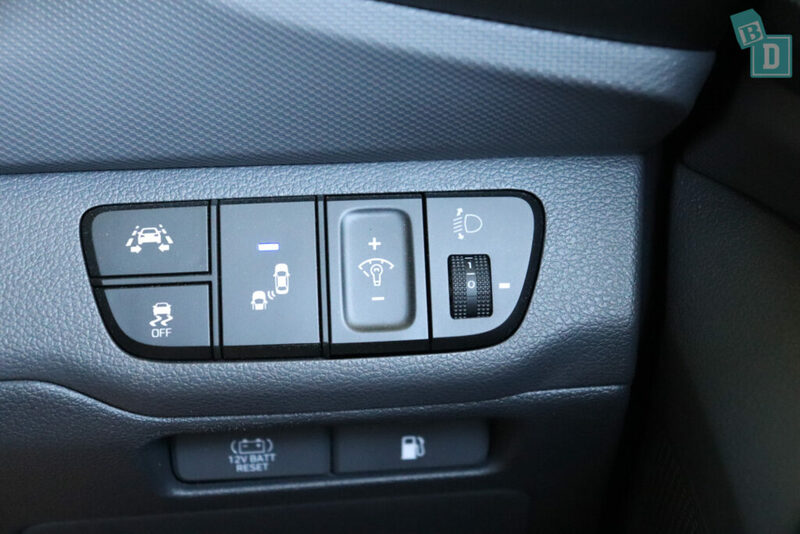 There is lane departure warning (LDW) in the Ioniq and you turn it on and off with a button by your right knee. It also beeps and flashes a light to alert the driver. The lane keep assist (LKA) in the Ioniq has quite a strong pull when keeping you in a lane. 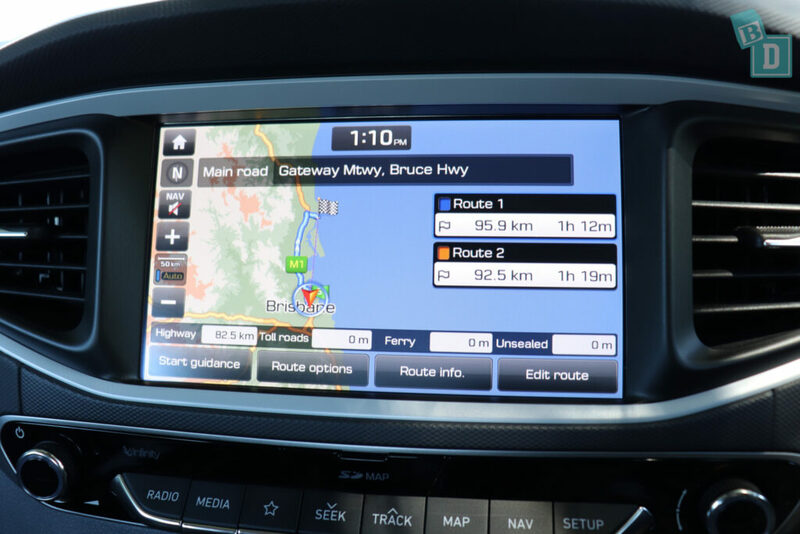 The Sat-Nav is simple to use and the voice can be easily muted by pressing the volume button on the left-hand side of the map screen. 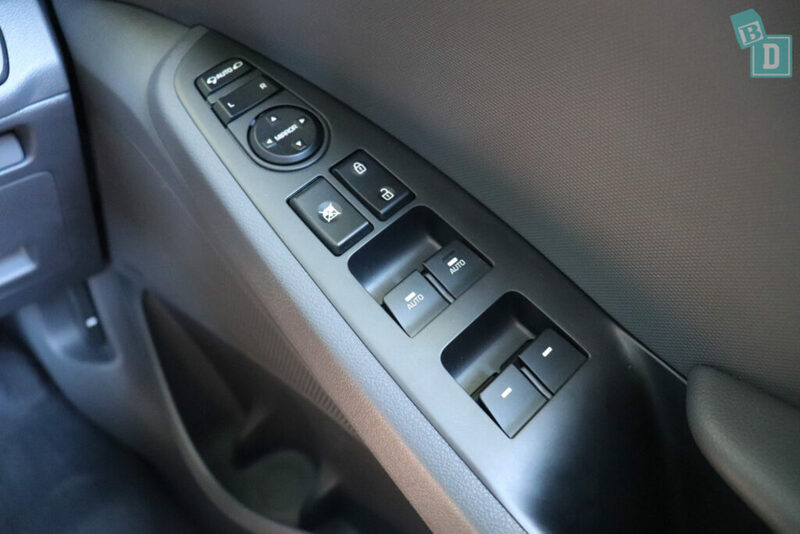 You can lock the doors and windows from the control panel on the driver's door. The windows and doors are lovely and quiet in the Ioniq when you open and close them. I found you can come to a stop with the engine still running and get out of the car without sounding any alarms. 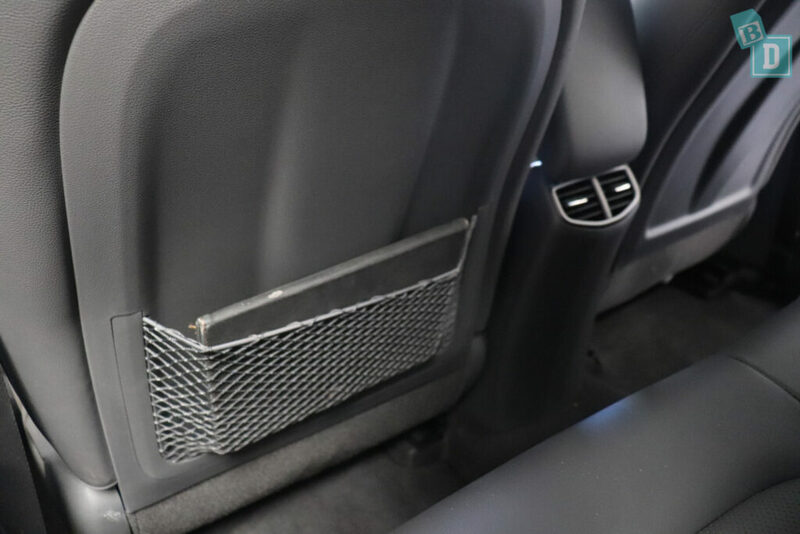 There is a seatbelt removal alarm for the front and rear passengers, an alarm sounds and lights alert you on the central console for the rear passengers. 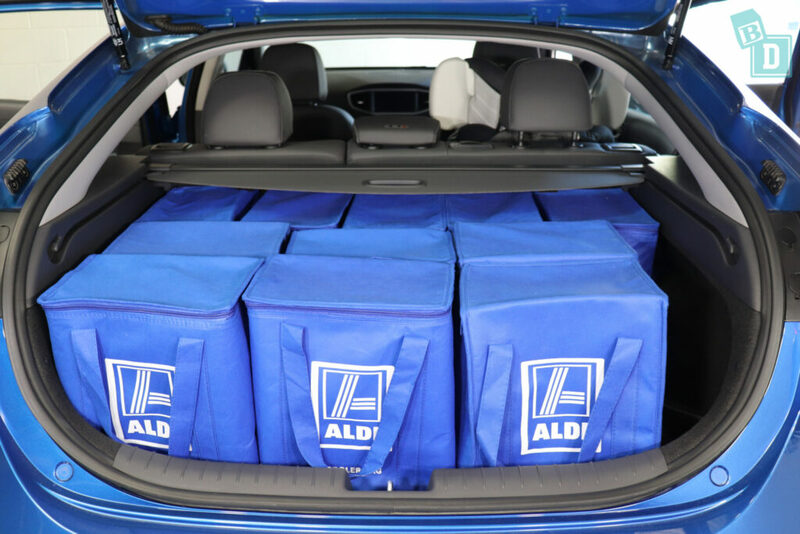 So… How many child seats fit on the Hyundai Ioniq hybrid? 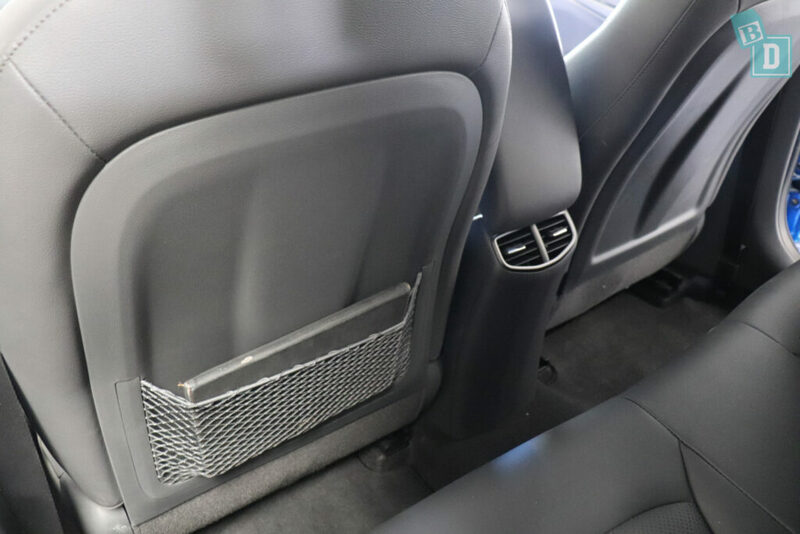 There are three top tether points across the rear seat backrests of the Ioniq, they are easily accessible through the boot and by reaching over. They are within plastic guides that are clearly marked and I found them easy to connect to. The two outer rear seats have ISOFix points between the base and seat backs, they are not within plastic guides and I actually found them difficult to locate in between the cushioning when installing the child seats. 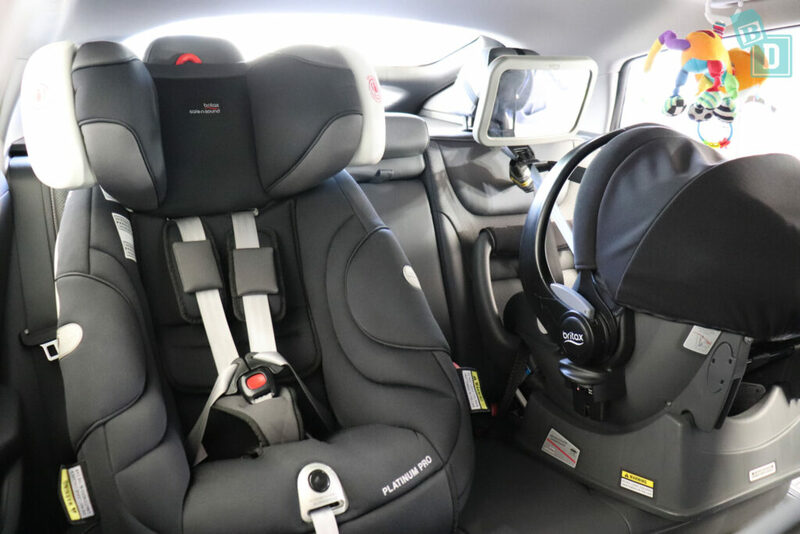 I only managed to fit two child seats into the Ioniq; The rear-facing Britax Unity infant capsule and forward-facing Britax Platinum Pro in the two outer seats. I found I couldn't fit a third child seat in because the roof of the Ioniq came in at the sides and so the car wasn't wide enough to fit the three across! 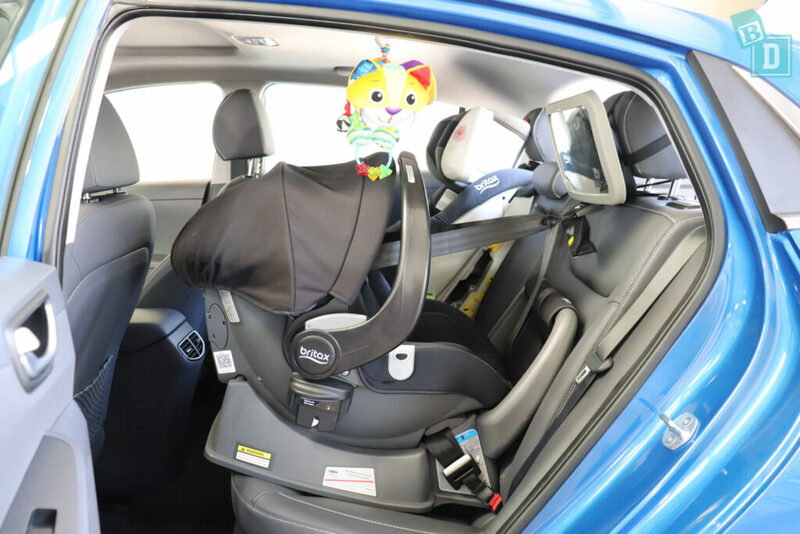 Posting bub into their child seat from inside and outside the car is tricky because of the low roofline and the doorways slope down towards the back of the car and narrows. There is room to feed bub in the back if you only have one child seat installed. 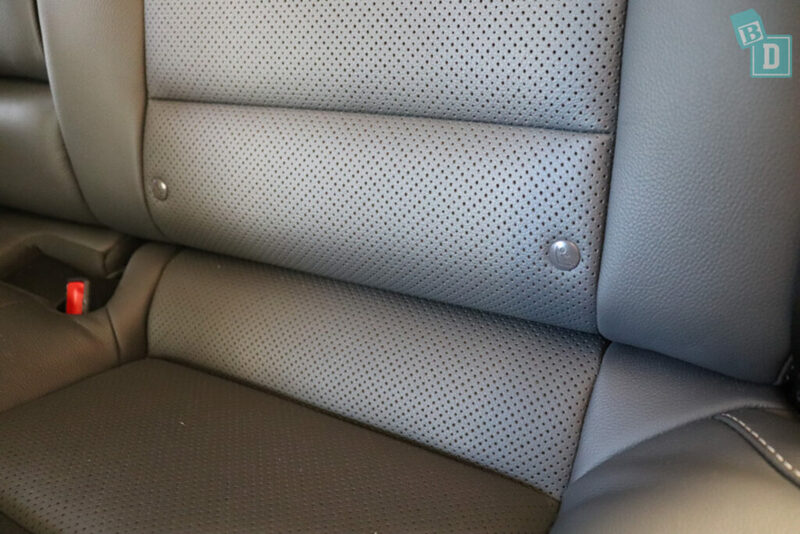 The seats are leather with perforated central panels because they are heated and cooled which makes keeping them crumb and spillage free a bit harder. 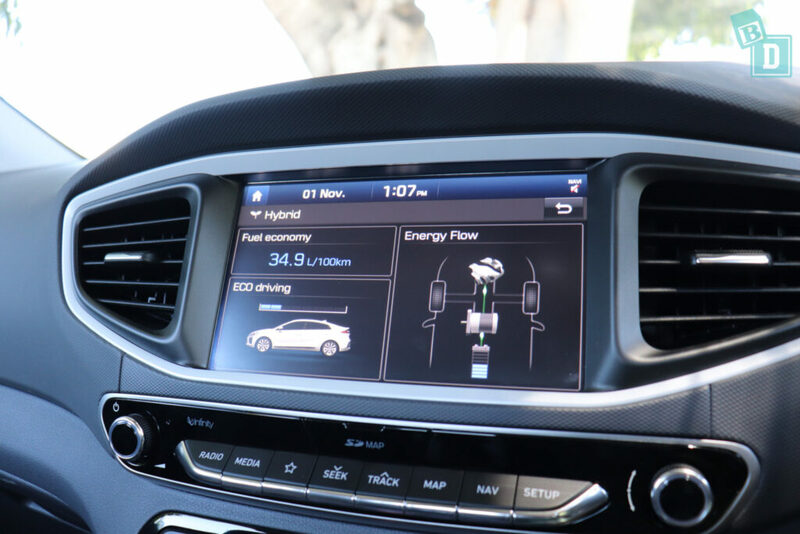 So… How comfortable is the Hyundai Ioniq Hybrid? And how good is the Hyundai Ioniq Hybrid to drive? In the front of the Hyundai Ioniq Hybrid, the seats are nice and comfortable and they have electric adjustments. They are heated and cooled and the steering wheel is heated too. The headrests are not adjustable and I could not have a ponytail! For a mum travelling in the back with bub, the seats are comfortable, but there would not be room to sit between two child seats. The side of the roof slopes inward, which could encroach on your headroom if you are tall and sitting in the outer seat. The steering wheel was fully adjustable in/out and up/down. 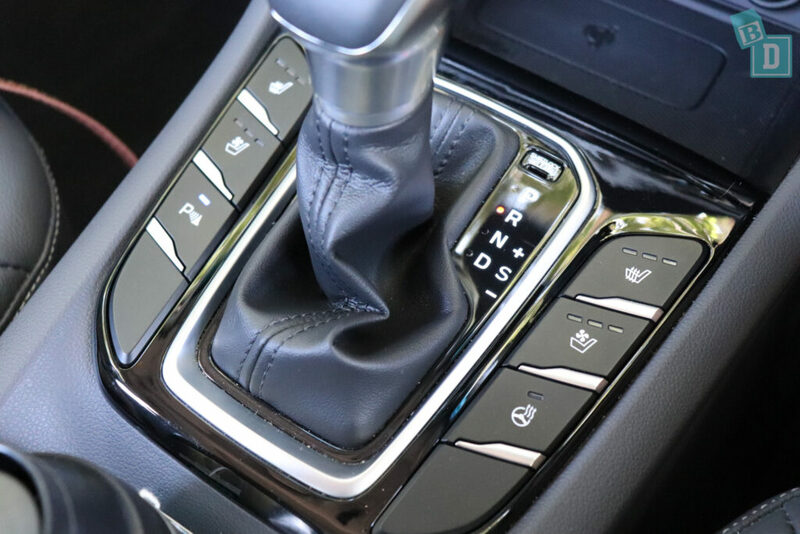 There are four air-conditioning vents across the front dashboard; two central ones and one at either end. 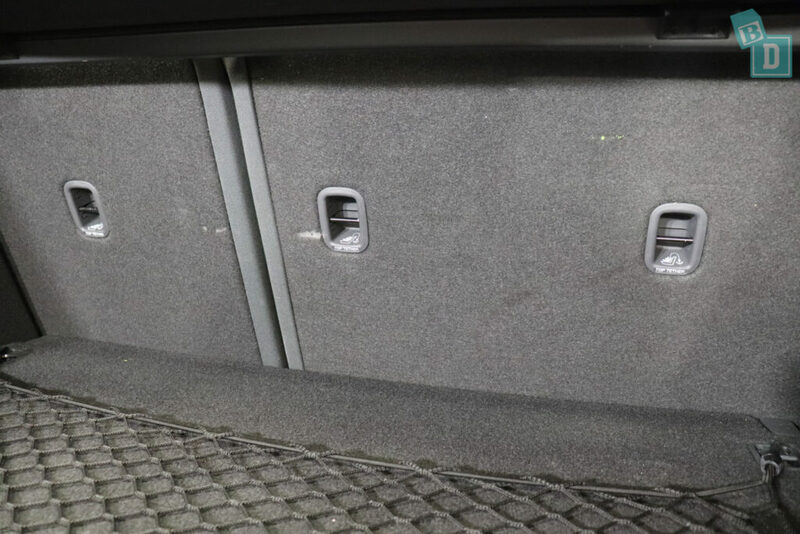 There are also two rear air vents in the back of the central console box that are reachable from the front while driving. The controls for the aircon are on the central dashboard, which I found nice and easy to locate and use whilst driving. I liked the driver only option for making more energy efficient use of the aircon (on the rare trips I do on my own on the way to and from Kindy pick up and drop-off!) The ionq aircon has a really nice flow and was not blowy or disturbing. 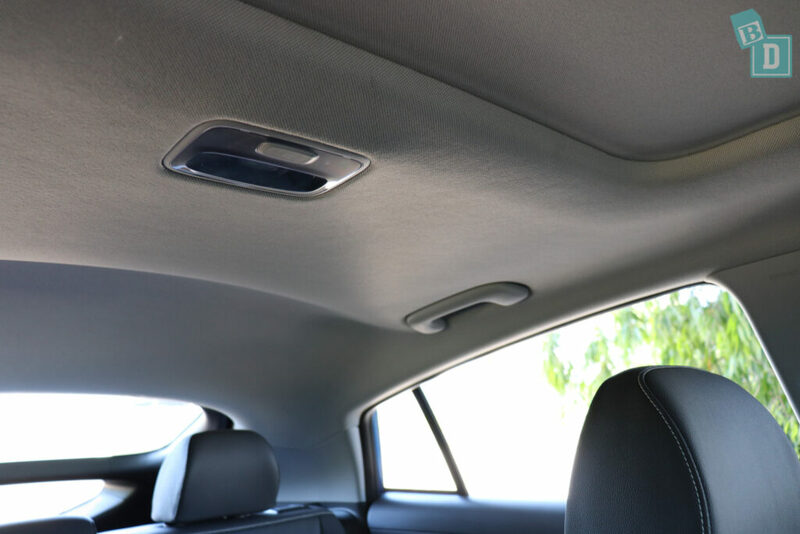 There are lit vanity mirrors in the front visors but they are not extendable. There is also a glasses case in the ceiling. The interior light in the in the back is in the centre of the ceiling just behind the sunroof which is not too far back so I can reach it from the driver's seat while driving, which is fantastic! The windows in the Ioniq are not overly deep but are very long and the back windscreen goes down very low with a split across the middle, making visibility in car parks etc when reversing very good, especially at that low level where kids might be. That said, I did find that with two big child seats installed it's not that easy to see out of the back anyway. One thing I have noticed since being a mum is I hate it when I reach a destination or get home from being out and Tulsi has either done really well in the car or she is screaming her head off and I have done really well to keep it together for the entire journey (usually the latter!!) and it takes 10 minutes to park the car! It can be really stressful. Usually I dread parking new cars as they take longer in our tight apartment block carpark, but the Forester was simple to park as the visibility and cameras was so good! There are handles above both rear doors I found they are positioned too far forward to hold a baby toy in the right place for rear-facing passengers. 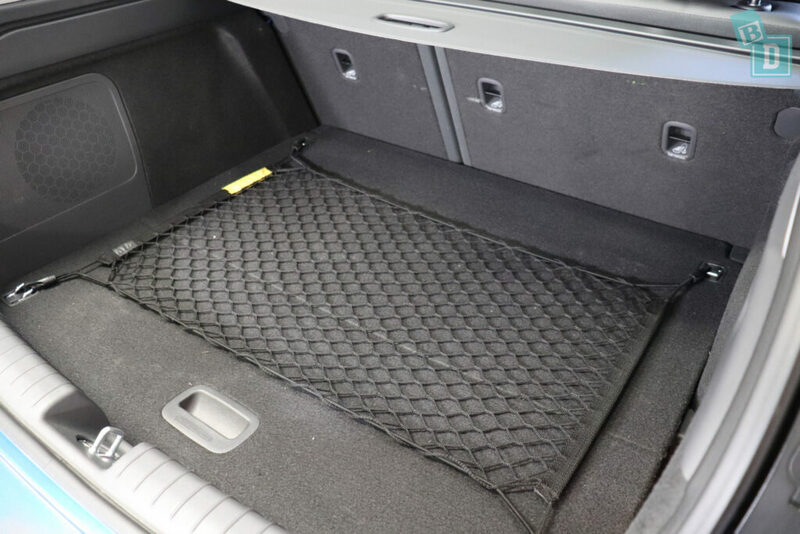 There were carpet floor mats throughout the model I tested. 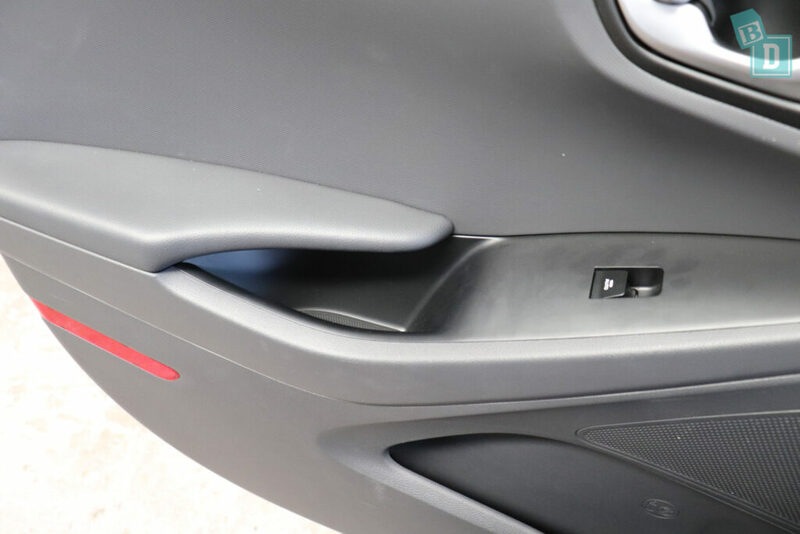 The Ioniq has a really handy keyless entry which I find really useful, you just touch a part of the door handle to open and clock the car, it's great when you have arms full of child and bags etc to not have to fish around for your keys!! So… How safe is the Hyundai Ioniq? The new Hyundai Ioniq scored a five-star ANCAP safety rating in 2016. Scoring 90% for adult occupancy protection, 80% for child occupancy protection and 70% for safety assist. The adult protection scored 5.74out of 8 in the full-width crash test, 7.45 out of 8 in the frontal offset test, 8/8 in the side impact test and pole tests, 2.31 out of 3 in the whiplash protection and 3/3 in AEB city test. Child occupant protection testing scored 39.4 out of 49 overall and 12.39 out of 16 for the dynamic front test, 8/8 for the side test, 12/12 for the restraint installation and 7/13 for the onboard safety features. ANCAP reported- In the frontal offset test, protection of the chest of the 10-year-old dummy was ADEQUATE and WEAK for the 6-year-old dummy, while protection of the neck of both dummies was MARGINAL. In the side impact test, protection of both child dummies was GOOD and the vehicle scored maximum points. 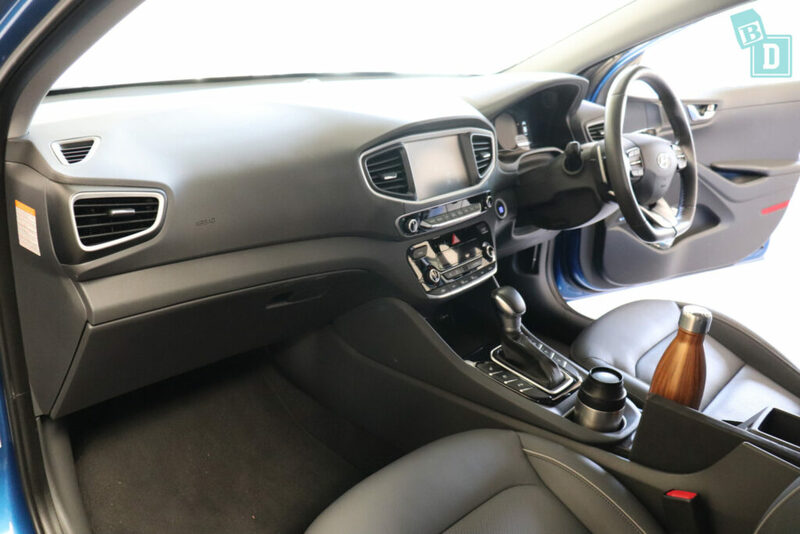 Seven airbags come as standard; there is a driver’s knee airbag as well as dual frontal airbags, front side airbags and side curtain airbags for the front and the rear side passengers' heads. All models of the new Hyundai Ioniq come with seatbelt reminders for front and rear seats. 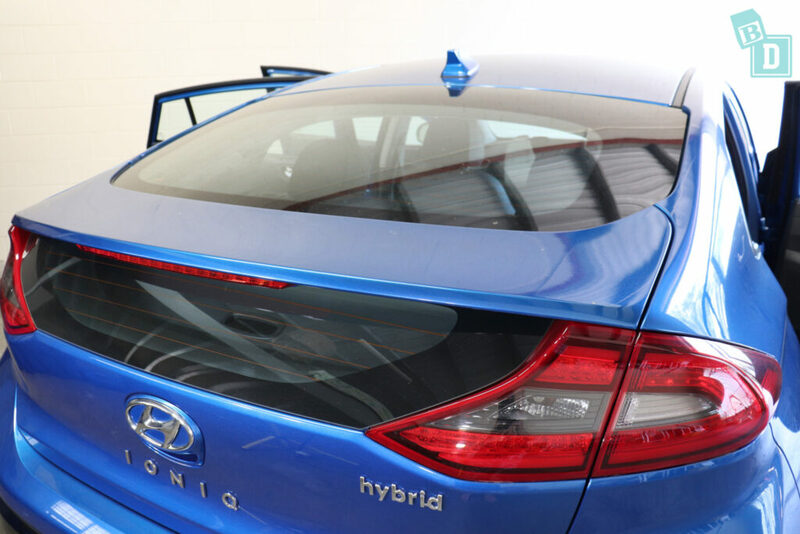 As standard, all Australian models of the new Hyundai Ioniq come with adaptive cruise control (ACC), anti-lock braking system (ABS), autonomous emergency braking (AEB) city, interurban and VRU, automatic headlights, blind-spot monitoring (BSM), daytime running lights (DRL), electronic brakeforce distribution (EBD), electronic data recorder (EDR), electronic stability control (ESC), emergency brake assist (EBA), emergency stop signal (ESS), drowsiness alert, forward collision warning (FCW), hill launch assist, lane departure warning LDW, lane keep assist (LKA), rear cross-traffic alert (RCTA), tyre pressure monitoring systems (TPMS). 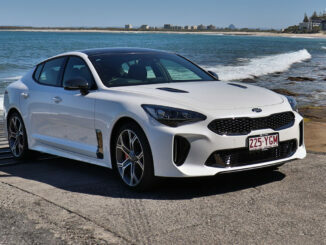 Only Australian models come with rear cross-traffic alert (RCTA), and blind-spot monitoring (BSM) as standard, these are not available on the base variants of New Zealand models. 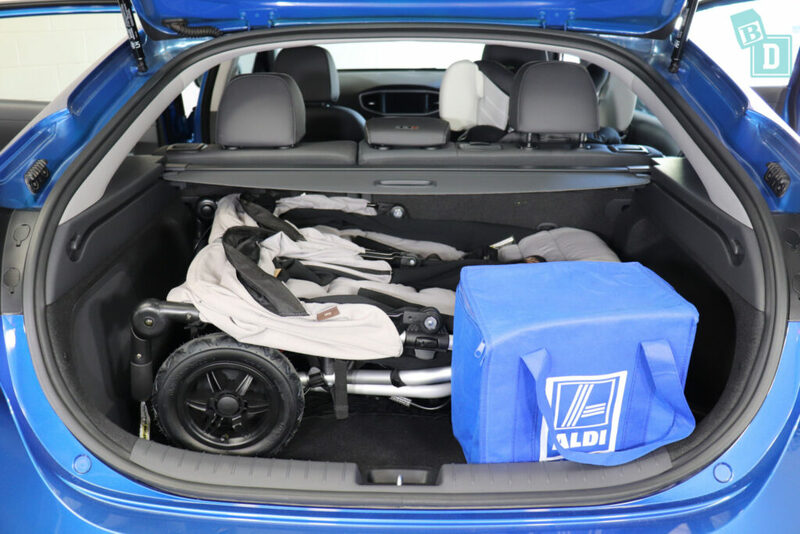 Which seven-seat SUVs can fit a tandem stroller in the boot?